Milisus Digital Media — Mobile Advertising, mobile marketing, global mobile solutions - Global mobile solutions for your advertising requirements. Leaders in Latin America with own inventory. We care about your traffic. Only tested offers in US, LATAM, EUROPE, ASIA and OCEANIA. New offers are tested daily, not converting ones are removed. We drive installs to your Android OS Apps. Reach the right audience for your App or game. Non-Incentivized installs on CPI basis. We are experts in Android. Alpha- and beta-testing are important if you want to make a great app. We provide a small group of testers. For Advertisers we offer our own LATAM inventory. 17 apps, 1.000.000 DAU, Entertainment category. CPC, CPM and CPI basis. Superior quality traffic. Ad units: Banners, Interstitials and Rich Media. 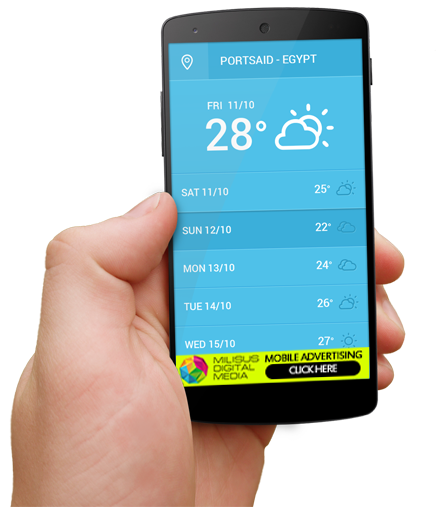 We will help you to create and manage mobile ad campaigns. Monitor your campaigns in real time. The reports are updated continuously and each pageview is reported seconds after it occurs. Do you know anybody who doesn't have a mobile phone, nowadays? Everybody has one. We can publish hundreds of graphics to demonstrate it, but it's not necessary anymore. We all live it everyday of our lives. The first thing you do when you wake up is to check stuff on your phone or tablet. We've never been so close to the consumer. To advertise on mobile, first of all, you need to think mobile. Your strategy and ad designs need to fit the mobile advertising market. Here at Milisus Digital Media we would love to help you with it. We are dedicated exclusively to the mobile platform. Simplifying the market is all we do. For publishers and App developers we have all the innovative tools and solutions to manage your ad inventory and increase your ROI. For advertisers in Latin America, we offer our own high quality inventory (1.000.000+ daily active users) available for both branding and performance campaigns. Latin America, in the next few years, will see the fastest growth among mobile Internet users. In 2013, it went up by 45%. Argentina, Mexico and Brazil are among the countries with the fastest increase in mobile internet users. It's our pleasure to introduce some of our partners and companies we work with. We wouldn’t be here without them. As an application developer, you always want to boost the revenues generated from your inventory to their highest levels. Let us help you get the results that you deserve by providing you with several options of risk-free advertising that will take your app to the next level. With do it CPC, CPM, and CPI, and we can handle the highest volume levels imaginable.